Game conversations are all too often static and stagey: there’s none of the messy, fun and characterful back and forth that makes a conversation sparkle. Using Ink and assisted by Sally Beaumont, Jon Ingold (Heaven’s Vault, 80 Days) will create conversations that are dynamic, contextual and full of moments of connection. AdventureX is the only convention dedicated to narrative-driven games. 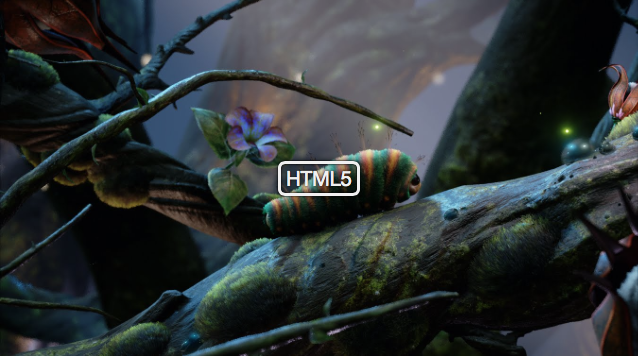 WhIM is an acronym for What-If Machine, a three-year research project studying the potential of computer generated fiction. The site has a series of whitepapers that explore many aspects of creative writing, including the development of compelling character arcs, generating dynamic stories around a given topic, and even motivational slogans and poetry. 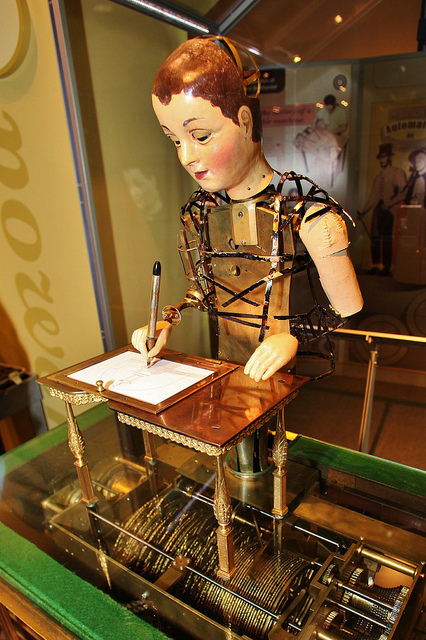 The theories involve machine-learning and the analysis of vast literature libraries, to invent interesting, influential stories that resonate with three-dimensional characters struggling with internal conflicts, and story arcs built to illustrate characters’ motivated changes. It’s heady stuff! I’m still getting through it. The researchers generally acknowledge that self-evaluation is in its infancy, as computers have no idea whether their generated plots are at all compelling, much less coherent. A white paper on generating a single-sentence ad slogan was able to serve a tossed salad of poetic buzzwords but nothing close to grammatically-correct language – generations of machine-learning will only make this better. Another paper suggests a system whereby characters evolve, transitioning through the conflicts of seemingly contradictory traits. An arc from “good to bad” for instance, or “loser to hero”, means a character already has elements of both traits which are tested or strengthened based on story events. 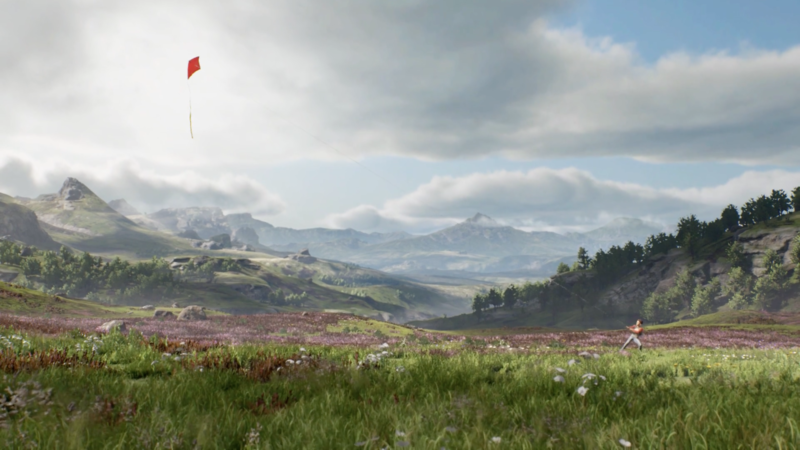 Already we have games with branching narratives and non-player characters (NPC) that are influenced by, and react to, the player’s choices – even the actions of other NPC, but nothing close to a completely computer-generated story. That said, the white papers are a treasure of research ideas. articy:draft 2 is a collaborative environment for the creation and organization of game content like quests, interactive dialogues, characters, items and level layouts – from first design to export right into your game. 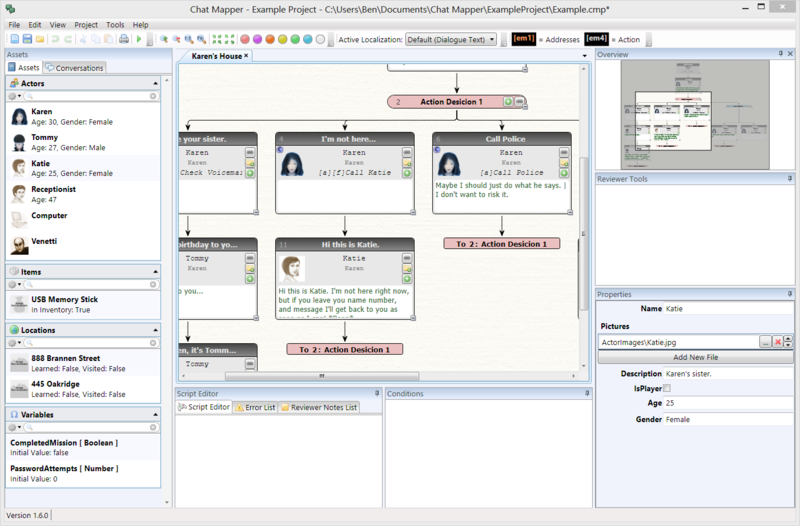 Chat Mapper is a branching dialog editor from Urban Brain Studios with Lua scripting and XML export. 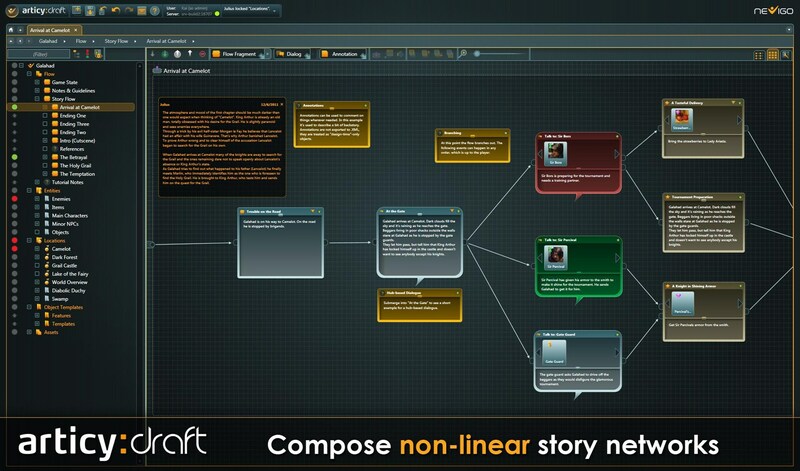 Non-Linear Branching Tree Graph Visualization, Conversation Simulator using TTS voices, and multiple export formats for printing actor scripts and for getting dialog into various 3rd-party tools like Dialog System for Unity. It is free to try, with pricing that ranges from $65 for an Indie License, $495 for Commercial, and an If You Have To Ask You Can’t Afford “Publisher” level which includes a player for Unity.